GPC, also known as Size Exclusion Chromatography (SEC), is the most direct method for determining the molecular weight distribution of a sample. This technique is fundamental in analytical testing as the molecular weight of a material is directly related to its physical properties and industrial grade. During Standardized GPC, sample components are dissolved in a suitable solvent, chromatographically separated based on molecular size, detected using a Refractive Index detector and compared to standards of known molecular weight. The most important aspect of a successful GPC analysis is the achievement of a purely size-based separation. 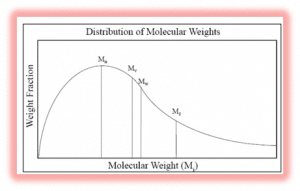 The correct mobile phase and column stationary phase must be chosen to decrease the potential for column-sample interaction and retention. Jordi Labs' 100% divinylbenzene (DVB) resin is functionalized to reduce the aforementioned chemical interactions through mechanisms such as charge-charge repulsion. Thirty years ago, Jordi Labs was founded on the characterization technique of GPC and we have continued to expand our capabilities ever since. Jordi Labs now offers GPC analysis in practically all solvents at room temperature due to our extremely rugged and long-lasting DVB columns.Trust your GPC analysis to the industry's most dependable and experienced GPC laboratory! Jordi Labs' team of PhD chemists have written several white papers on GPC found below.